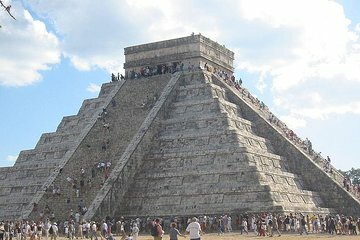 Descubra uma das Novas 7 Maravilhas do Mundo: Chichen Itza. Esta viagem de um dia a partir de Cancun apresenta-lhe a antiga cidade maia com um guia informativo. Aprenda sobre estruturas famosas no sítio arqueológico, como o Templo de Kukulcán, também conhecido como El Castillo. Depois do tempo livre para nadar em um cenote sagrado, dirija-se a um restaurante para almoçar em um buffet seguido de transporte de volta para o seu hotel a bordo de um ônibus de luxo. I WOULD NOT BOOK WITH ALTUS TOURS OR 7wonders Tour group. Worst tour experience I have ever booked with. The first review by Sara N was SPOT ON and I wish there was a second review to validate her review prior to me booking with this company. i just assumed one bad review was enough to overlook. 1. our tour guide MIKE started pitching sales on top of sales the entire day. started off with papyrus paintings from the mayans for 20 usd, various other items, and tips to conclude the tour. I woke up to him asking me if i wanted to buy something and I asked what it was that was being sold for 20. he responded, well you don't know because you were sleeping' I felt he was pretty conscending this way throughout the entire tour. 2. I booked an english speaking tour. Mike barely spoke/translated english 80 of the time so i was lost which is why i fell asleep in the first place and when he would speak in english, it would be mid spainish sentence and completely out of context. Example: He would say spainish-spainish... and then they would cut their heads off for the sacrifice in mayan culture. again, lost. 3. he did not follow the itinerary at all. he customized the itinerary to his liking and which cenote he felt like going to. i specifically booked this tour to go to a different cenote than ik kil because I knew it would be extremely crowded and I was right. I booked this tour to go to cenote hubiko and he took us to ik kil. We only had 45 minutes to rent lockers, towels, change, shower, swim, shower, change, and be back in the bus -- even though there were 50 other tours in line to do the same thing. 4. when we got to chichen itza, he jetted off the bus and disseapeared. I had to scour the crowd of hundreds of tourist with my disabled mother to find him again at the ticket office. when he began the tour, we almost lost him again because he was walking really fast and igored the fact that me and my mom were far behind the tour. I understand he has a schedule and others can walk faster, but it just goes to show the lack of empathy or consideration on his part. i was so fed up at this point when i caught up to the group the second time, i called him out for leaving us and ended up following another FULLY ENGLISH speaking tour shortly after. 5. Tour was advertised that they provide a free bottle of water, this was NOT provided. do not buy anything at the real mayab restaurant / gift shop, you will get ripped off by 3x what they charge at chichen itza if you even have time to shop so many tourist complained about buying things they could've gotten for cheaper as we past all the vendors at chichen itza. They would yell out 1 for things we paid 15 for. food at real mayab was mediocre at best, if you have a tour that will bring you somewhere else to eat, i suggest going with that. or going on a tour that will give you more time in valladolid skipping real mayab to enjoy a restaurant in that area. I considered doing a night tour or a early access tour and I wish i had because it was extremely hot midday at chichen itza and crowded. but ive seen it be a tiny bit pricier. The tour guide was very energetic and gave us sincere details about Mayan life around the area as well as the different sacred sites and their stories. The bus was comfortable and we were able to mingle with new friends. The driver drove safely and where we ate our lunch, we were able to experience a little ritual in the Mayan lifestyle. The pyramid complex was huge and spectacular and the swim to the cenote was done orderly, although, it would have been cooler if we had more time to do it. Overall, it was amazing. Galo was an amazing tour guide! He was probably one of the best guides I've ever had. He was super informative about the Mayan Culture and gave us the do's and don't's while we visited such sacred places. His charisma kept us entertained during the long bus ride to Chichen Itza and Cenote Ik Kil as well, and I was never bored. Our bus driver also did an amazing job of driving us safely point A to point B.
I highly recommend this tour - it was one of the highlights of my vacation in Cancún! We started the day early and did a lot throughout our tour, which was all clearly listed in the itinerary. The activities we did and the sights we saw was such a great deal for the price I paid for. We also had plenty of time to roam around and take pictures. Everything was flawless and organized, and all I had to do was enjoy myself. This tour was awesome. First they took us to a Mayan town where we saw artisan crafts and had lunch. Chichén Itzá was so impressive. And the tour was so informative. The cenote was the best part! It was incredible! It's a must see. Our guide Galo was awesome! Very funny guide, kept things entertaining. Very knowledgeable and loves what she does. Definitely had a good time. A lot to do in a day so keep up. It is a 12 hour day so stick to the schedule. As long as everyone follows this, then you might get extra time at another location. From past reviews, time is very limited at each location. I'd recommend wearing your bathing suit underneath you clothes. This will give me you more time at the cenote. Be courteous of other travelers and be at your pick up location on time. Pack a light snack with you for the 5 hour roundtrip bus ride. So lunch is first and it is a buffet of local Mayan cuisine. I think we spent too much time there 2 hours that could've been for Chichen Itza. The restaurant also has a souvenir shop. We are very open minded with our cuisine and I must say that lunch was very good! We had 2 hours at the ruins and because everyone was on time with the schedule we had an extra hour at the cenote! This cenote is busy so the original given time of 45 min is definitely not enough. Before heading home, you get to go to this small shopping plaza for 20 mins! Not really much time to do anything except buy some snacks from the food cart and stretch your legs. But it was a good time to interact with the local Mayans. Take time to learn about the Mayan culture and cuisine during this trip. Have fun! It was good for the price you pay.... Pyramids guide was good, also was good to skip the line and the time there was perfect. I liked the lunch in Valladolid and the town was very nice. I would dedicate more time to this even lunch instead of the chaman stuff. I think was a bit wasting time to queue for check in before to take the bus, this is something that should be done before considering you pay in advance for this service and all that you get is the wristband to get into the tour. Oh man. Alfonso - my boy - was the BEST tour guide ever. Gustavo was ON POINT with the drink service and Mr. Speedy Gonzales, our bus driver, drove so smooth, I was never worried about spilling my drink. Amazing service, wonderful staff, great experience overall. The Cenote was spectacular to behold - bring cash! It's much easier to haggle with exact change. Chichen Itza was impressive and definitely awe inspiring. Worth every penny. Overall Tour was good, but communication with Tour Company company was bad as they assigned the wrong section of the hotel for pickup in which wasted 2 hours before I was able to get picked up. I never received any communication prior to departure to confirm the pick spot. Unfortunately, this tour wasn't as great as my group and I imagined. It was about two hours before we reached our first stop. The tour guide talked the whole day! At first it wasn't so bad because he talked about the history and shared lots of information but because we started so early in the morning I noticed lots of the passengers were falling asleep and it was hard to focus on his stories. By the second hour it went down hill from there. He turned into a salesman. It was one sales pitch after another and continued that way the whole day! It was hard to relax or really take into consideration the value of what he was showing us because it was all for sale. The way the tour was marketed it presented that the 1st stop would be Chichen Itza then Cenote swim then lunch. But our tour guide decided to do everything backwards!? We started with Lunch to be honest a lot of time was wasted here just trying to push sales then the cenote swim and finally Chichen Itza. He gave us exactly 1 hour at the Cenote so by the time we changed our clothes we actually only had about 15-20 minutes to spare for the swim. Those of us who are not professional swimmers need more time to make our way through the place. It felt really rushed! we barely had time for photos. Also, in the tour it mentions Ik Kil Cenote which is a very popular one but the cenote we were taken to was different that was disappointing I think they just assumed we wouldn't notice It was very inconvenient because our hair got wet, makeup was wiped off and we were all wet/sticky going to Chichen Itza. Lots of others complained to our tour guide about why we went to the cenote swim first and he just brushed it off. By the time we reached Chichen Itza it was very hot at this time of afternoon and this was in Nov. which only added to the confusion of why we didn't come earlier when the sun wasn't so high. The tour was nice just didn't play out as advertised.